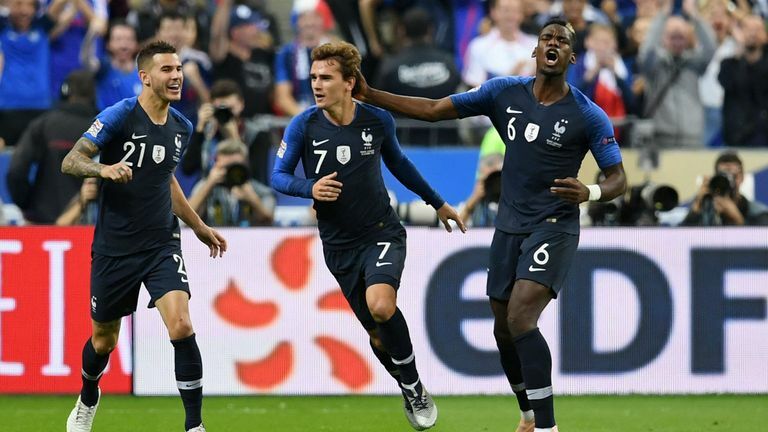 Antoine Griezmann netted two second-half goals as France came from behind to inflict a sixth defeat in 10 games on Germany with a 2-1 UEFA Nations League victory in Paris. Germany were much the better side in the first half, and deservedly took the lead through Toni Kroos from the penalty spot in the 14th minute, but wasted several chances to extend their lead. Their profligacy in front of goal proved costly as Griezmann stepped up to rescue his side. The equaliser was a brilliant header in the 62nd minute from a seemingly impossible position, before he converted from the penalty spot eight minutes from time to win it for France, after Blaise Matuidi was adjudged to have been fouled in the penalty area. 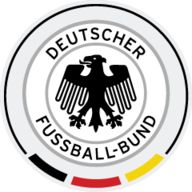 Germany's fall from grace continues, as they sit bottom of the Nations League A1 group, with a solitary point and relegation now a real possibility. France sit top of the group with seven points, and are now unbeaten in 15 matches. France: Lloris (7), Pavard (7), Varane (7), Kimpembe (7), Hernandez (7), Pogba (5), Kante (5), Matuidi (6), Griezmann (8), Giroud (6), Mbappe (7). Subs: N'Zonzi (N/A), Dembele (N/A), Ndombele (N/A). Germany: Neuer (6), Kehrer (6), Ginter (6), Hummels (6), Kimmich (5), Gnabry (7), Kroos (7), Schulz (6), Sule (6), Sane (7), Werner (5). France looked disjointed early on in Paris, and were soon unlocked by Leroy Sane, whose cross was ruled to have hit the hand of Presnel Kimpembe in the penalty area to gift Kroos the opportunity to break the deadlock from the spot, which he just squirmed under the despairing dive of Hugo Lloris in the home goal. Germany really should have then made more from a two-on-one position, but Sane's pass was overhit, allowing Lloris time to race from his line to tip the ball clear of danger. France continued to cede possession too readily, with Germany creating several more promising openings, but they could not add to their solitary goal. France named a rather imposing looking line-up, with just one change from the side that took to the field in this summer's World Cup final - Presnel Kimpembe in for Samuel Umtiti. Olivier Giroud lead the line once more for Les Bleus. Germany made five changes from the side comprehensively beaten by the Netherlands last time out, with Bayern Munich's Thomas Muller benched. Leroy Sane was back in the starting XI. After the break, France improved and started to find their rhythm, with Kylian Mbappe racing through before being denied by a smart save from Manuel Neuer. France continued to be frustrated, they looked to their talisman for inspiration, and Griezmann stepped up with a game-changing double. Lucas Hernandez's drilled cross had plenty of power on it, Griezmann arrived just inside the box, arched his back and guided a brilliant header into the top corner to level. France were in the ascendancy, and soon enough were gifted the opportunity to win the match, after Matuidi went down under a challenge from Mats Hummels and a penalty was given, much to the visitors' frustration. Griezmann made no mistake from 12 yards, leaving Germany with a mountain to climb to rescue their Nations League campaign. Who else? The best players in the world can be ineffective for large swathes of matches, but burst into life when it really matters, and Griezmann did just that in Paris. He barely had a touch in the first half, but his header that turned the match on its head in the Stade de France was right out of the top drawer. His coolness from the spot decided the contest. 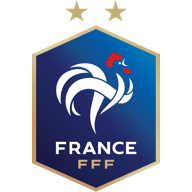 France travel to the Netherlands for their final Nations League fixture in November, while Germany also welcome the Oranje to Gelsenkirchen in November, four days after a friendly match against Russia.